 Honorary CDF Runner Deano the Dementiasaurus had a productive but exhausting time this weekend preparing for the Cardiff Half Marathon. 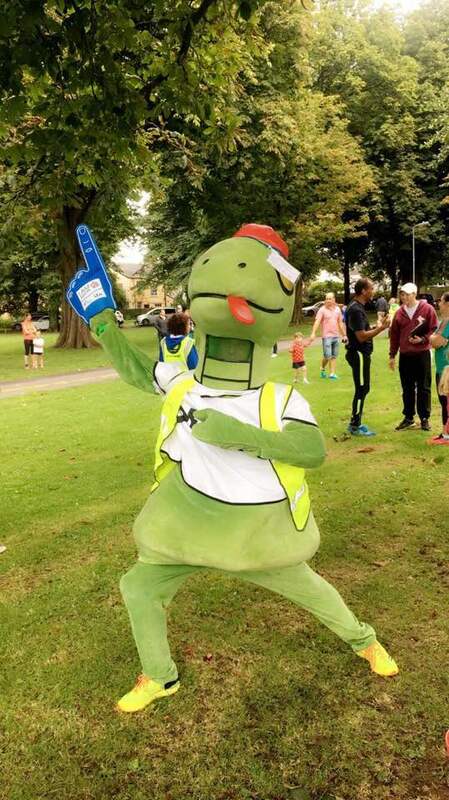 On Saturday morning he ran 25:45 at Cardiff parkrun and then on Sunday morning Deano enjoyed volunteering at Cardiff Junior parkrun. However, a close encounter with some ‘over-enthusiastic children’ left Deano’s tail in need of major surgery. 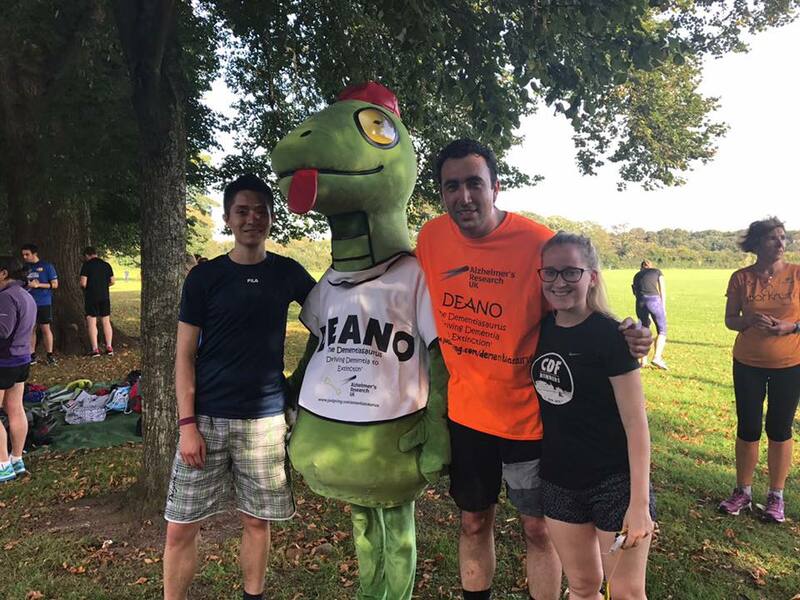 Afterwards, Deano joined C25K graduate Maryam for a (almost) 17km training run – the furthest either of them had ever run! He was humbled by the constant support of the wonderful Cardiff public on every path and street they ran. Dementia is a collective name for progressive degenerative brain syndromes which affect memory, thinking, behaviour, communication and emotion. Although each person will experience dementia in their own way, eventually those affected are unable to care for themselves and need help with all aspects of daily life. This can transform the lives, not only of the dementia sufferer, but also of their family and friends who care for them, in frightening and unpredictable ways. Dementia is one of the fastest growing illnesses around the world. Worldwide, 47.5 million people have dementia and there are 7.7 million new cases every year. There are 850,000 people with dementia in the UK, with numbers set to rise to over 1 million by 2025. At current rates, this will soar to 2 million by 2051.
inevitable part of ageing. However, despite various ways to prevent its onset, medicines to slow its progression and treat its symptoms, and support to manage living with the disease, there is currently no known cure for most types of dementia. Alzheimer’s Research UK is the UK’s leading dementia research charity, dedicated to funding pioneering scientific studies to find ways to treat, cure or prevent dementia. As of 2015, Alzheimer’s Research UK funds 127 research projects and has committed nearly £40m to dementia research. Specifically, current studies are employing cutting-edge stem cell research to look into what causes nerve cells to die and why. Donations are essential for Alzheimer’s Research UK to fund their work, with world-class advisory panels ensuring that funding decisions are taken in a rigorous and effective manner.